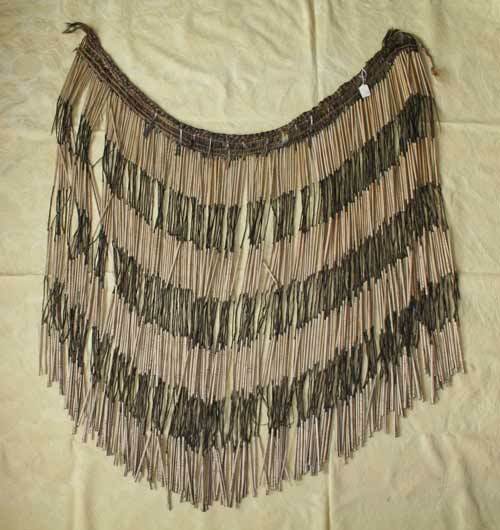 A piupiu is a skirt-like garment made of flax strands that hang from a belt. When the wearer moves, the strands sway to and fro. New Zealand flax is processed by an elaborate method to make piupiu. The leaves are first stripped back to the fibre in regular sections, leaving sections of unstripped leaf in between. Then the loose fibres are twisted together by a spinning action. The strands are boiled and dried so they whiten and roll into tubes. Then they are dyed black. Only the exposed fibre takes the dye, creating a striped black and white effect. Finally, the strands are attached to a woven waistband.